For the 2010 Boettcher Investigator, following the problem wherever it leads, and breaking down established silos in pursuit, has been a lifelong quest – one that continues in her current role as an appointed faculty member in both molecular, cellular and developmental biology (MCDB) and computer science at the University of Colorado Boulder. Growing up, Robin expressed interests in genetics, computers and working on old cars that were nurtured by her father, an engineer. While taking genetics classes “in secret” as an undergraduate computer engineering major, a professor encouraged her dual interests and connected her with a research opportunity at Baylor College of Medicine. “My path changed from that day forward,” said Robin. After receiving bachelor’s degrees in computer engineering and genetics, Robin earned a master’s in computer science and a doctorate in biomedical engineering from Washington University in St. Louis. She completed a postdoctoral fellowship at Massachusetts Institute of Technology before being recruited in 2009 to the BioFrontiers Institute at CU Boulder, a place she feels at home. Robin’s primary focus is understanding the problems that lie at the intersection between genetics/genomics and machine learning. 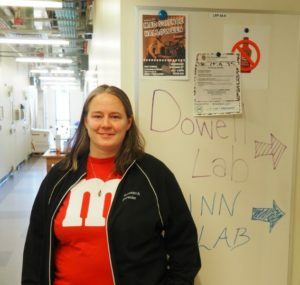 To this aim, the Dowell Lab employs a diverse mix of undergraduate, doctoral and post-doc researchers from fields such as computer science, creative writing, molecular biology and neuroscience to develop new approaches to biological questions. Robin is also very intentional about diversity in her lab. In fact, she believes that the experiences and perspectives, especially of traditionally underrepresented thinkers, are especially well-suited for interdisciplinary problem-solving. “Because we’ve never quite fit in, women and minorities are often more comfortable with interdisciplinary fields, especially those that emphasize the human component and collaboration,” said Robin. That’s one of the reasons that Robin hosts underrepresented students in her lab as well as Boettcher Scholars through the Boettcher Foundation’s collaboration grants program. Currently, with the assistance of 2016 Boettcher Scholar Michael Gohde, Robin is producing a curriculum that will translate scenario-based case studies into “choose-your-own-adventure” type stories to teach emerging researchers ethical decision-making. Michael has also been involved in the development of machine learning software for the improved analysis of genomics data.